So, this week is American Heroes Week, and it focuses on our brave service men and women. But our police, firefighters and EMS personnel are also heroes in my book. All of them stand on America’s front lines in times of crisis – and sacrifice their time, their energy, and sometimes their lives for the well-being of the rest of us. The men and women we honor this week did not enter their professions seeking glory or gratitude – they did so because they felt it important to serve their communities. And that’s why I support them with my art every chance it get, and involve them every chance I get in the various projects and community events I sponsor and participate in. For example, that’s why I stepped to the plate when I got the call from Capt. 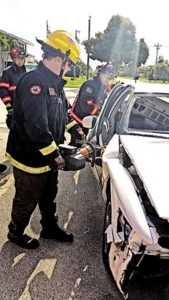 Bill Russell of the Matlacha/Pine Island Fire District telling me they needed a new Jaws of Life. 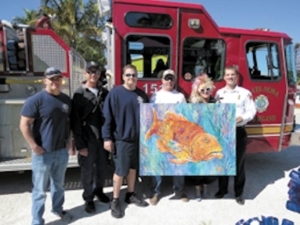 I told him to have his firefighters pick out a painting that we’d raffle off at the Taste of Pine Island. 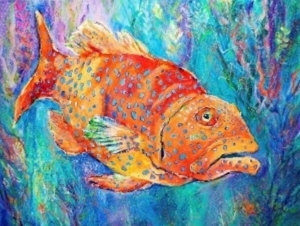 They picked a large painting of a Leomatized grouper and renamed him the Fire House Groupie. But that’s just the start of this story. Heavy rains forced the postponement of the Taste of Pine Island for more than a month. The sponsors finally had to cancel it all together. Well, they still needed a Jaws of Life, so I decided to raise money at the meet-and-greets I hold in my gardens every Sunday morning during the season. Then we held a Firemen’s Fest as the final event at which several firemen came and painted copies of Fire House Groupie. My friend Mercedes Price Harry of Vino’s Picasso donated the paint supplies and showed everyone how to make masterpieces of their own. More than 50 people showed up at $100 each. 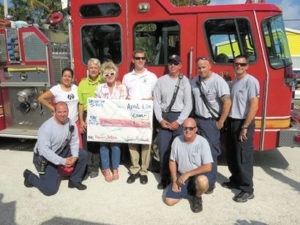 We not only had a tremendous time, we raised the money needed and now the Matlacha/Pine Island Fire District has a new life-saving device. This is just one example of what we can accomplish when we all work together. More, it’s an example of how firefighters, EMS techs, emergency room nurses, teachers and our military take time away from family and friends and donate their time and energy after hours to get things done when the need arises. All of America’s heroes make unheralded personal sacrifices for the good of the nation. They spend holidays and birthdays in ambulances, emergency rooms, and operating rooms. They miss time with their own spouses and children for the sake of keeping us safe and healthy. So I concur with Maryland Congressman Andy Harris, who said “Too many of our heroes’ individual sacrifices go unacknowledged each day, which is why I stand with President Trump this week to thank these heroes for their unrelenting service.” BTW, Congressman Harris is not only a physician, he’s a Republican, don’t ya know.